Product prices and availability are accurate as of 2019-04-21 02:09:27 UTC and are subject to change. Any price and availability information displayed on http://www.amazon.co.uk/ at the time of purchase will apply to the purchase of this product. A soft grip handled walking stick which is ideal for whose who find holding a normal walking stick painful. 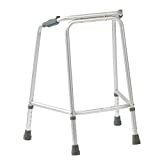 This folding adjustable height walking stick has a soft gel handle making it very comfortable to hold. 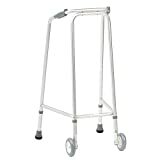 Adjustable in height from 33 - 37", Manuactured with sturdy 7/8th diameter anodized, extruded aluminium tubing. Metal lock nut. Max User Weight 135kg (21stone) Colour: Grey/blue tye dyed shaft, blue gel soft hand grip and matching blue ferrule. Please note that this item is priced excluding vat and to obtain this item at this price a simple vat exemption certificate will need to be completed, this will be sent to you for completion and return or if you prefer you can send an email to us giving the users name, address and condition. To be eligible for vat at zero rating the user should have an on going condition such as osteoarthritis, diabetes, heart condition, stroke, breathing difficulties such as COPD or in fact any condition for which a person takes regular medication.